Apparently, I am the only person on the planet that hasn't had this jello salad. We had it our monthly PTA Council meeting today. Ooohhh sooo gooood!! There was leftover -- we had it for dinner! MIX pretzel crumbs, 1/4 cup sugar and butter. Press onto bottom of 13x9-inch pan. Bake 10 min. Cool. ADD boiling water to gelatin mix in large bowl; stir 2 min. until completely dissolved. Stir in cold water. Refrigerate 1-1/2 hours or until thickened (spoon drawn through leaves definite impression). 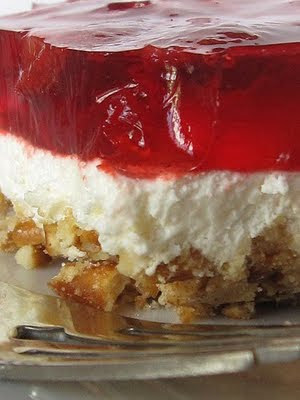 Stir in strawberries; spoon over cream cheese layer. Refrigerate 3 hours or until firm. I can't tell if this looks really good or really scary! I'm betting on the good though - it's amazing how good jello desserts can turn out! OMG I loved this stuff as a kid! We always had it at family summer picnics! Jell-O salad = gross in my book. This one does not sound horrible though. I will never understand why people think putting something like carrots into jell-o is a good thing?? Not a fan of jello, but this does look appealing (my husband would probably love it). Admittedly, I"m not a big jello fan either -- but this won me over! This is a huge holiday favorite at our house - I make an extra crust to have on hand for later on - making the crust is the most time consuming part.